Millennials were born between 1982 and 2004. Right now, they are between 10 and 34 years old. Many of them are entering their prime earning years right now. Also, they’re savers. Millennials want to attach to a brand, but they are not loyal. They’ve watched the world economy melt down, personally. They’ve never known a time when there wasn’t the Internet. If you’re in the banking industry, you have a tough, tough road ahead of you. They’re not into objects but experiences — if you sell products, stop it. Sell experiences instead. They spend differently than previous generations, preferring to throw cash at new experiences and adventures and to reward socially responsible companies that they can connect with and deem authentic. It’s easiest to see this change in the food industry, where millennials are helping to disrupt the landscape of casual restaurants and boosting the earnings of chains such as Chipotle and Panera. Millennials are spending the greatest amount of money in the coming year on fresh fruits, organic foods and natural products. Less favorable, in their minds, is spending on luxury goods, soda, applications and handbags. An industry that millennials particularly dislike is banks. Forrester says the future of mobile is the seamless blending of the mobile with the functionality of a desktop — Samsung has a patent out for something called Project Arcadia, which will allow users to easily port Android and iOS apps across a billion Windows devices. Imagine a world where laptops and power cords aren’t necessary! In the next two years, we’ll have ingestibles — we’ll be able to take a pill that will provide information for doctors about the inner workings of our body. 11% of transactions per week are conducted via mobile devices in-store. 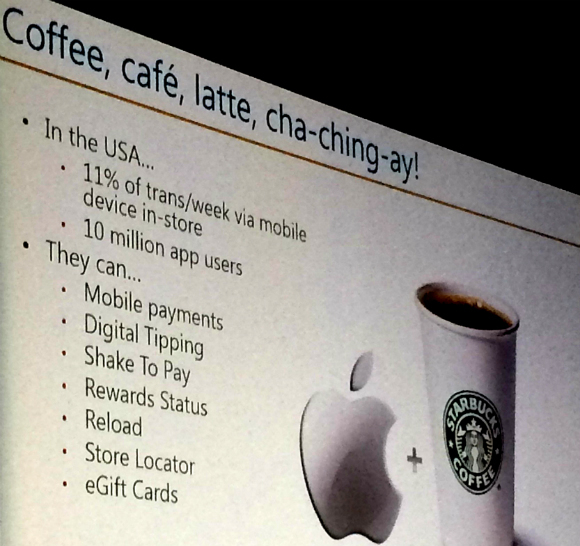 Starbucks has 10 million app users. Forrester says that while he doesn’t enjoy Starbucks coffee, he loves the sense of community that comes with being a Starbucks consumer. “I crave the moment when I flash my band in front of the register and the cashier is like, whoa that’s cool! I’m blowing minds one latte at a time,” says Forrester. I’m blowing minds one latte at a time, says @DuaneForrester. Bye, Bye Wallet, Hello Freedom! “I have a phablet and I swear I’ll never go back. I even edit Power Points on my phone. But the fact of the matter is it’s still a small device. Phones are small devices, so we have to be careful about what we show on these devices,” says Forrester. Self-driving cars will open up huge areas of opportunism for local businesses to interact with “non-driving” drivers. 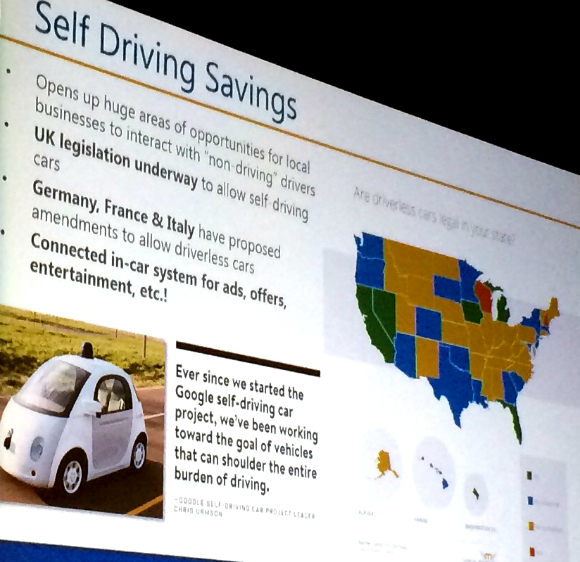 UK legislation is underway to allow self-driving cars. Germany, France and Italy have proposed amendments to allow driverless cars. Connected in-car systems will enable ads, offers and entertainment. Forrester says, “Data is the new oil.” Why? It’s the most valuable commodity in the world and it’s growing exponentially. Right now, you’re leaking data. Data signals are everywhere. You might be concerned about this … but what can you do? According to the Federal Trade Commissions, Axciom has a minimum of three thousand data points on every single person in the U.S.
Axciom has a minimum of 3,000 data points on every person in the US, per @DuaneForrester keynote. Bing has been able to pick the Eurovision winner. How-Old.net can look at you and determine your age and gender. Google machine learning systems learned how to identify faces without explicitly being told how. To be the bridge between a user’s intent and experiences the world has to offer. To allow users to express themselves in natural, intuitive ways — not just punch keywords. To become the ecosystem of connected devices that serve relevant information. One way into all the riches? Use Schema.org. Watch for concert tickets and buy them. Scan for discounted airfares to selected destinations and book them. Proactively search for coupons, sales and announcements. Accept invitations on your behalf and update your calendar. Organize your calendar — manage running errands against traffic and other events on your calendar. Imagine telling your Agent, “I need a cable for my phone,” and not having to think about it again until the cord shows up at your hotel. That’s the reality that’s coming. Your Agent will know what phone you have and what cord you need, where you’re staying, and be able to search to find a retailer who can deliver that phone to your hotel. Will you be ready for the day search is internal, not external? When search is baked into every touchpoint we have? When it’s no longer a destination page, but something that brings you answers without your asking for them? Data is critical: sharing it, consuming it, understanding it. Know what motivates the upcoming generation. Traditional online marketing is changing now, today. Stop thinking about driving traffic. Start think about visitor task completion. Solve for consumer needs three steps ahead to win. 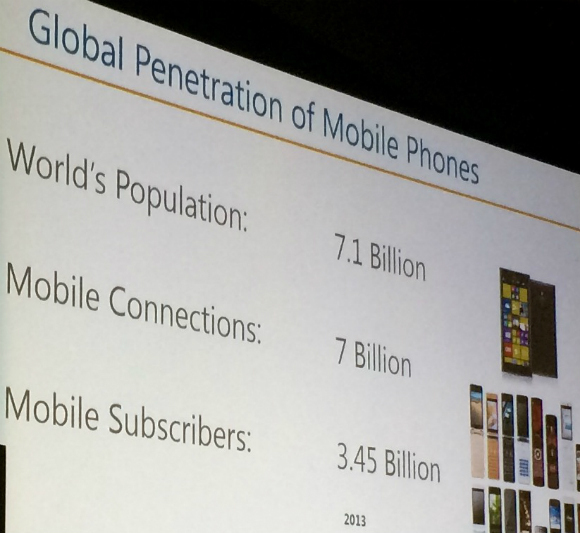 If you think mobile is coming, you’re already losing. Read “Future Crimes.” Forrester just read this book, written from a cyber-crime point of view. It dives deep into EULAs and explains coming problems. Thank you for sharing this excellent post. Being a SEO person I would definitely need this information. Great question. I don’t have any stats on that but now you’ve piqued my interest and I’ll be looking out. I do think there are things that can be done to make long articles more reader-friendly for mobile. For instance, include a sort of TOC (deep links to anchors in the article at the top of the article) so readers can jump to sections they’re looking for. It helps to remember that your mobile visitor is a different persona, they have different needs and interests. They probably aren’t the reader who’s going to look at long articles, but rather go straight to the contact page or about us page, to find out if they want to get in touch. Then optimize those pages for people who are on the go and in need. 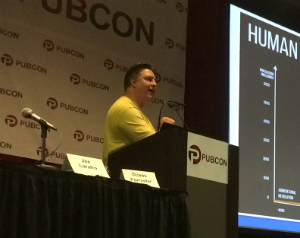 You may want to read another liveblog post from around this same time: https://www.bruceclay.com/blog/winning-at-mobile-ppc-advertising-smx-liveblog/. Aaron Levy’s presentation, “Know Your Mobile Audience,” is good food for thought on this subject. Thanks for reading, Michael!